The world is in the middle of Hunryu(韓流)boom. The 'Winter Sonata' sensation has been running through the Japanese Islands, but there(the Korea) is a superstar known by everyone from before WS. 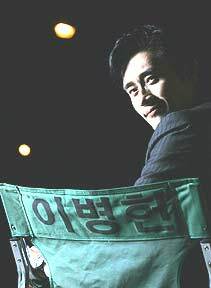 His name is Lee　byung－hun. Both in name and reality he is a top actor who lords it over the Korean show business. From October2,NHK of the ground-wave has started broadcasting'Beautiful Days' in Japan. A photo album and DVD are on sale. There is a public presentation of movie,.....the sighn of a real breakthrough of Korean entertainment has become strong now. I crossed the sea of 'Genkainada' and approached the real face of Lee byung-hun. The sky was without a speck of cloud and colored bright red by the evening sun. He was wearing a black suit and was absorbed in reading a scenario. It takes about 30minutes by car to reach there from the city of Seoul. and he has been focusing his efforts in the movie 'Sweet Life'which will be on general release in Korea next February. In spare moments from filming,he agreed to be interviewed by me. During the one hour recess, the interview started with him bowing politely in Korean style. He said 'How do you do? I'm glad to meet you'. He lowered his head and he warmly offered me his both hands.